As basic weaponry, red dot sights are priced between $20 to $800. The technology isn’t that thorough, yet consumers shell out a lot to have a combat-grade optic. Aimpoint is a company that comes to mind when discussing quality red dots. They manufacture a quality product, but there are other options to choose from. It isn’t necessary to pay $400 for a quality product. In fact, you can purchase more intricate weaponry for that same amount. We all desire affordable quality products. The trick is to locate the right balance between quality and budget. Consider the following suggestions. Each first world nation has its own optical firm. Japan has an array of high-tech sport optic manufacturers. Korea also produces first-rate pieces for their military. In fact, DI Optical has been giving the South Korean military their own brand of red dot sighting optics for a while now. I plan to purchase the DI RV1, which will set me back about $229. The American versio of the Korean T3N red dot sight is called the RV1. It is better looking and sleeker than the T3N. In front of night vision, the T3N can be used on a Daewoo rifle. There are 7 daylight settings and a quartet of night vision settings for the optic. I wasn’t able to test the night vision features, but the daylight settings can be used in every situation. Operating the RDS HIGH doesn’t come with any washout or brightness issues in broad daylight. The dot is crisp at 2 MOA. The tint of the lens is not very noticeable. At a medium setting, 1 low-mounted AA battery gives the optic enough power for approximately 20k hours. This is a vital step in the progression of red dots since fewer quality imports show better runtimes. DI Optical’s electronics package never shuts off and can last just under 33 years, which, for a combat grade optic, is a very impressive runtime. At the 10 o’clock position, you can see the emitter, but you can’t when the optic is mounted further out. I could mount the RV1 without any trouble. The bolt where the knob tightens creates a recoil lug that stops the mount from shifting. The mount is a basic clamp-type device that tightens the optic down on to the rail via a coin slot. The package elevates the optic to a reduced third co-witness, but for absolute co-witness, the optic can’t be positioned. The windage caps won’t get misplaced since they are fastened together. The W/E can be adjusted with a coin slot. 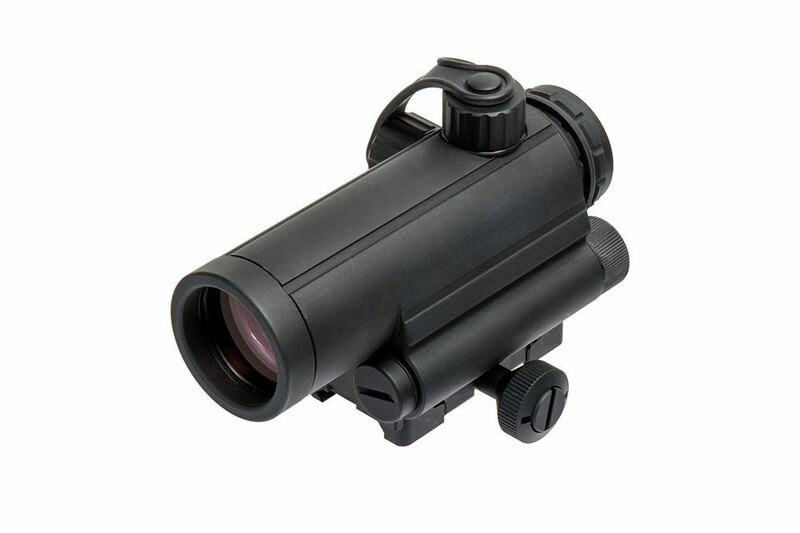 The initial problem some shooters will deal with involves the 1 MOA optic adjustment. Most shooters are used to half-minute modifications. This won’t be a concern during practice, and worst case scenario, you’ll be half a minute off an exact zero. The red dot should be enough for shots up to 400 yards away on a large target. At intermediate and short ranges, your ammunition choice and shooting performance will have more of an effect on your targeting ability (as opposed to having the optic off by a half minute. The optic is said to be resistant to impact and sealed. I recorded mine getting soaked and impacted, as you can see in the following video. My first impressions of the optic are positive. This is a single piece optical body made of aluminum. The construction is very protective and weighs in at 14 oz., which differs from the usual “micro” red dot form factor. Although it might not be as trendy as modern red dots, the fact that it’s durable is more important. DIO seems to have provided us with the optic we’ve been waiting for. The caps are fastened to satisfaction, the dials are solid, and the mount is built tough. The mount can also replace ARMS #17-type mounts that cover spacers and cantilevers. It has been properly manufactured. Posted in Red Dot Sights, Rifle Scope, Rifle ScopesTagged Red dot sight.